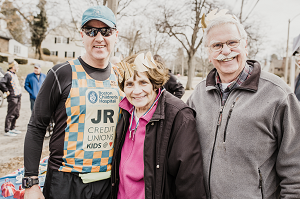 Last year I ran my third Boston Marathon for the Credit Unions Kids at Heart Team. I started my journey last year unsure about so many things. Would I finish the race? Would I raise the money? Does this make a difference? What I quickly learned was a HUGE Yes to all three. My anxiety quickly turned to passion once I began my training and fundraising. I had the honor of meeting Carter and Lucy Buckley. One of the research projects we support on the CU Kids at Heart Team is made in the memory of their son CJ Buckley. CJ died of a brain tumor at the age of 17. I felt an instant connection to his parents, I got to meet them the day I went with my CU Kids at Heart Team to deliver the hard earned $400,000.00 we had all raised to Boston Children's Hospital. I learned through his parents what a special person he was, that he loved sailing, he loved his family and he loved his friends. I could also see the sadness in their eyes, losing their son is something I know hurts them every single day. It saddens me that they and other families have to go through the pain of losing a child. I have also had the honor the past three years of meeting some of the doctors who are working on ground breaking research. To hear them speak on critical breakthroughs in research makes me hopeful that one day we will have found a cure. Although I have never met CJ, for the past three years he has been my inspiration, guardian angel, and training partner. When I am down or struggle through the many miles we run, he appears and keeps me going. I am proud to be running once again in honor and memory of CJ Buckley - I will be thinking of him every step of the way - Let's do it for CJ!